What Is a Vertical File Cabinet? Vertical file cabinets feature at least two drawers for storage. Vertical file cabinets allow for space savings in small rooms and easy perusal of files. A vertical file cabinet is a piece of office equipment in which files full of documents can be stored. The cabinet usually features two or more drawers in which files can be stored, and these drawers may or may not feature locking mechanisms to keep the stored files secured from theft or tampering. A vertical file cabinet can be made from metal or wood, depending on the needs and aesthetic desires of the office workers and owners. Sometimes the cabinet is designed to accommodate hanging files, which are specially designed files that have arms that attach to slides within the drawer. Hanging files are useful for keeping the files upright, especially when the vertical file cabinet drawer is not completely full. The file features small arms on either side of the folder, and these arms hang from specially designed slides or tracks built into either side of the drawer. A user can hang the file without risk of the file falling over and spilling documents, and he or she can also easily peruse various files within the drawer without causing disorganization. Dividers are also very often included within each drawer of the vertical file cabinet to help organize files easily. The smallest vertical file cabinet models usually feature two drawers, though some exceptionally small ones may only feature one drawer. Some desks, for example, will feature one drawer for smaller storage space. Other models will feature two or more drawers stacked on top of each other to create a tall tower, as the name implies. The largest units will feature five or six drawers. The advantages of the vertical cabinet include space savings in small rooms and easy perusal of files. Shorter people may have difficulty accessing files in the top drawer, however, especially files at the rear of the top drawer. Many offices feature step stools to help avoid this problem. The alternative to vertical file cabinet models is horizontal models. The advantages of the horizontal cabinet include easy access and additional tabletop workspace within the office, though these units do tend to take up more space horizontally in the office. Like vertical models, the horizontal cabinets are usually made from metal, but they may or may not feature slide-out drawers. Instead, files may be placed upright on shelves with dividers, though some models do feature slide-out drawers for ease of use and convenience. How Do I Choose the Best Small File Cabinet? 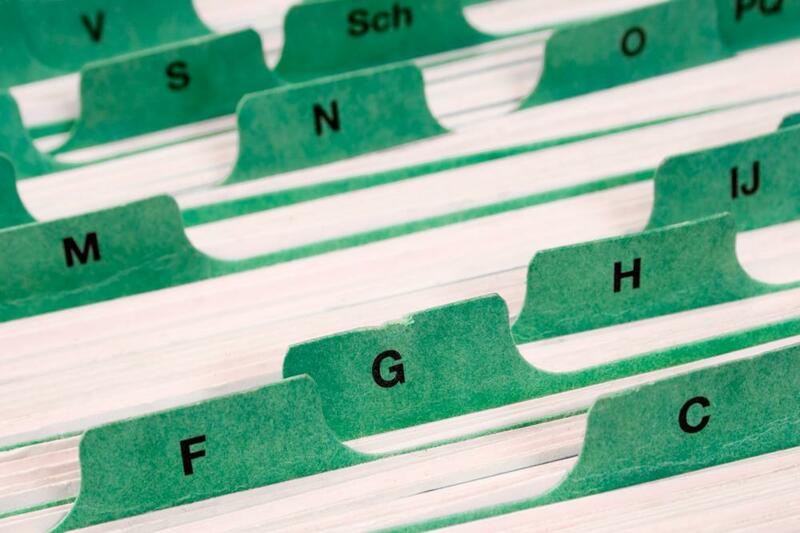 What Are File Cabinet Dividers? How Do I Choose the Best Used File Cabinet? What Are the Pros and Cons of a Metal File Cabinet? How Do I Choose the Best File Cabinet Size? What Is a Blueprint File Cabinet? 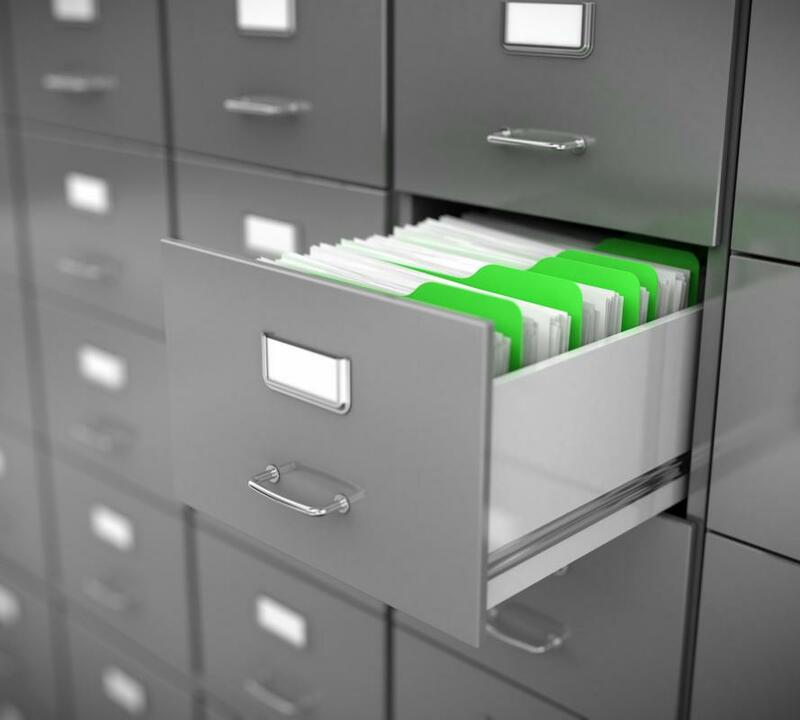 What Is an Open File Cabinet?